Thanks to modern technology, the Lab of Science allows visitors to take a look at a forest biotope at a cellular level. The audio-visual installation was relocated to the National Museum of Agriculture from the Czech pavilion at the 2015 EXPO World Fair. The exposition is closed until 31 May due to reconstruction. Thank you for your understanding. 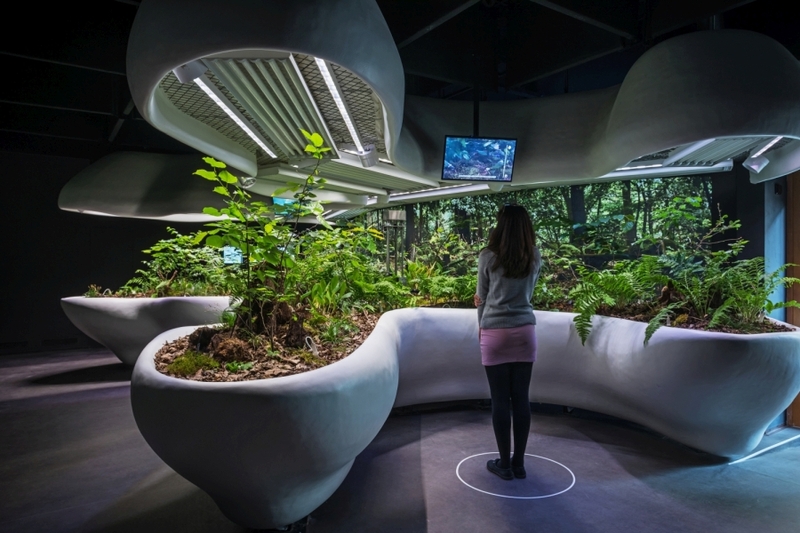 This multidimensional project, which was implemented by the company Full Capacity, s.r.o., presents a live forest set in a futuristic laboratory. As well as live plants and a futuristic flower pot, the installation also features interactive cameras, projection surfaces, microphones, and automated irrigation and air-conditioning systems. The project is a direct response to the human need for a presence in nature. Silence heals and takes us from the mere surface into the depth of things. Dive into silence, surround yourself with silence and open up to an extraordinary experience. You will find the Lab of Silence on the second floor of the Prague building of the National Museum of Agriculture behind the Gamekeeping exhibition. We would like to thank Mr Jiří František Potužník, Commissioner General for the Czech Republic at EXPO 2015, for his considerable assistance during primary negotiations and the relocation of the project.